The two strategies deriving from ignorance get translated in a number of different ways, and those translations matter. Consider some of the alternatives for the “pull” impulse: desire, greed, attachment, passion. The English terms come preloaded with entire cultural histories, and we can’t simply forget these. For us “greed” is entirely negative, but “passion” carries a number of very positive aspects. For that matter, “attachment” and “desire” have some good senses too. “Aggression,” “hatred,” “anger,” and “aversion” are the terms most commonly used to translate the “push” quality mentioned above. Here too there can be confusion: “aggression” is more-or-less entirely negative for us, but sometimes the word “anger” is used positively, and even “hatred” too, as when people speak about a hatred for violence or brutality, for example, or a hatred of samsara (deluded existence). My general experience within Tibetan buddhism has been that for us humans, practically speaking, pulling isn’t considered quite as problematic as pushing, at least in general. The poetry of Trungpa Rinpoche, for example, is full of “passion,” love of human beauty and creativity, love of the earth, the elements. He was famous/notorious for his numerous affairs and prodigious drinking. He celebrated heartbreak in love and more broadly “the genuine heart of sadness,” one description of the bodhisattvic impulse itself. Another lama put it this way: he said that even though any desire/attachment etc will cause suffering sooner or later, as beings on the path attachment has more to be said for it than aversion, specifically because it involves relationship. There is acknowledgment of connectedness, a potential for openness. Of course, this is present too in aversion – in the Tibetan view, all confused emotional energies have a flip side that is nothing other than their pure wisdom quality. But again very generally speaking, “householder” or non-monastic buddhism recognizes a positive need for “passion” in our more usual, ordinary sense of the word. We need to generate a lot of energy for the path, to cultivate confidence, strength, and a kind of burning desire to be free of conditioning, compulsion, ignorance. As the lama mentioned above continued: even if your passion is just for an old shoe, at least you’re relating to something! There’s something concrete to work with. Whereas aversion/hatred rejects relationship itself. 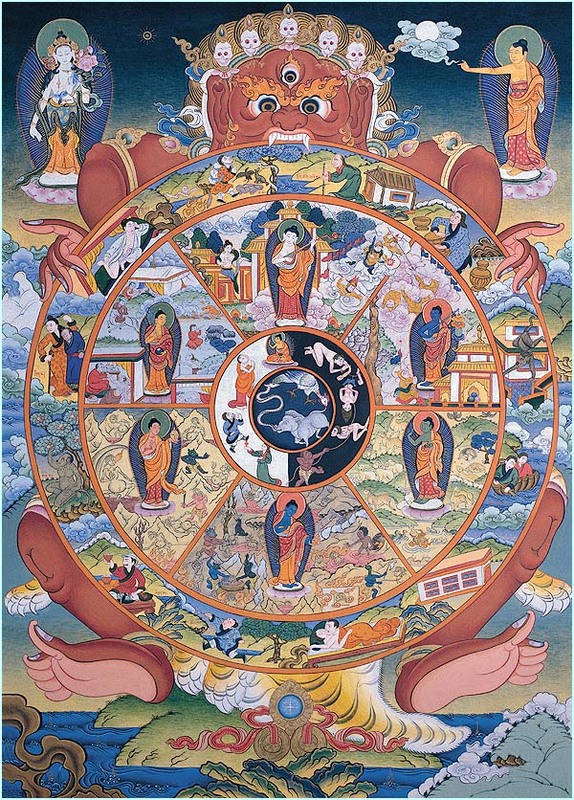 And perhaps this is also why, of the six traditional psychological realms of buddhism (represented in the third spoke of the Wheel of Life), that which is associated with “desire” is the human realm, considered the most fortunate of the six. Whereas the realm dominated by aggression and hatred is of course the hell realm – the least fortunate of all.